One of the funny things about what we do is the way, sometimes, it seems like we work and work but aren’t actually accomplishing anything. In reality, much of what we have been doing this spring is laying groundwork for things that come later. 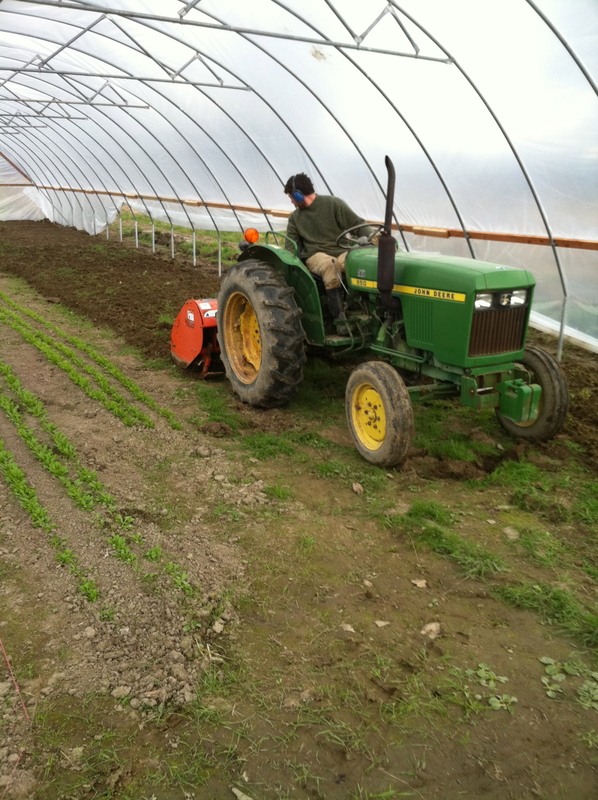 For instance, seeding 20-30 flats of vegetables each week is an accomplishment, but it doesn’t feel the same as when we plant those veggies in the ground. This week, we saw the fruits of much labor come together in a whole flurry of accomplishments. One week ago today, we finally finished our last greenhouse. Then we immediately moved our 25-30,000 seedlings into it. Then, we direct seeded 16 beds of veggies – three beds of salad mix ingredients, two beds of turnips, two beds of radishes, two beds of beets, two beds of kale, one bed of bok choy, one bed of spinach, one bed of arugula, one bed of broccoli rabe, and one bed of carrots – and covered them with floating row cover (to warm them up). 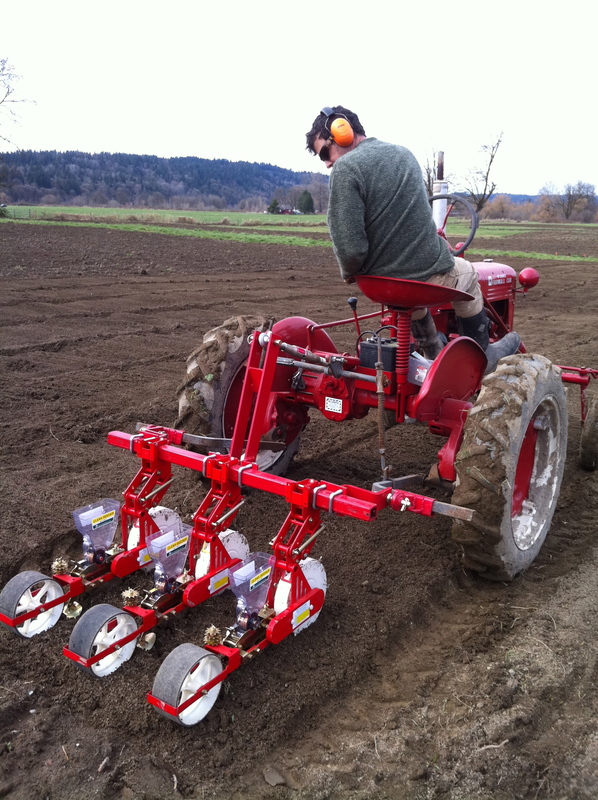 We are still learning the intricacies of our new tractor and seeders, but the speed with which we were able to seed so many beds was very exciting for us. 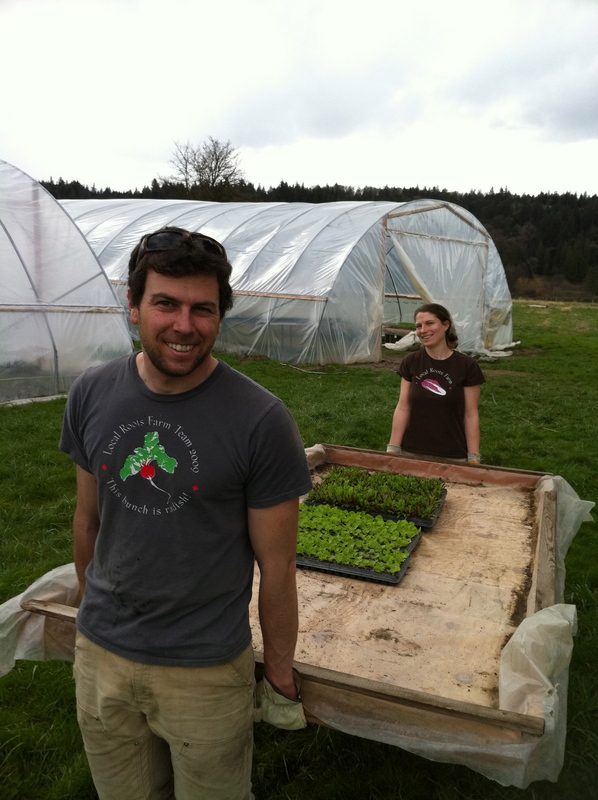 And we also transplanted two beds of chard, one bed of lettuce, and one bed of lacianato kale. 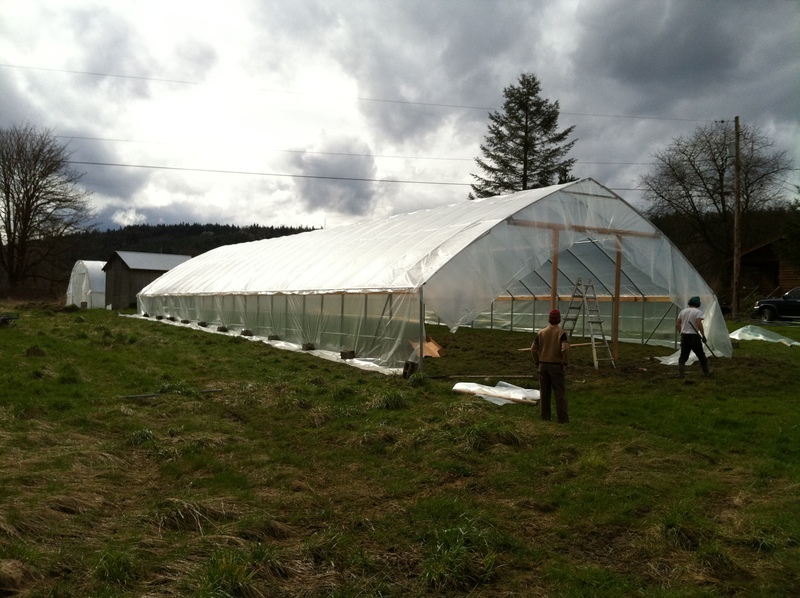 Then we spaded our (relatively) old greenhouses to get them ready for tomatoes. 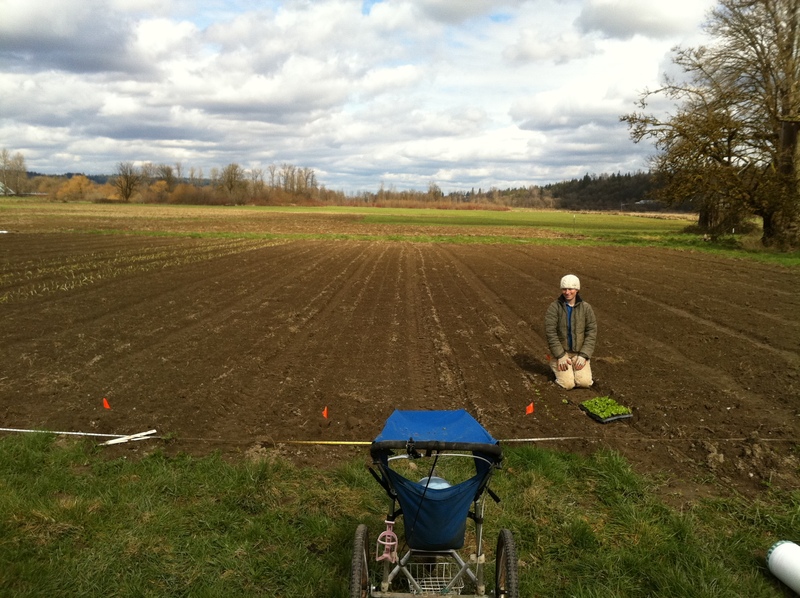 Then we spaded and furrowed 12 beds for potatoes. This part of the story probably deserves an entire post unto itself, since getting our hilling/furrowing discs working involved a visit to our neighbor Van and a lesson in how to use an oxy-acetyline torch… but I’ll leave it at that, for now. 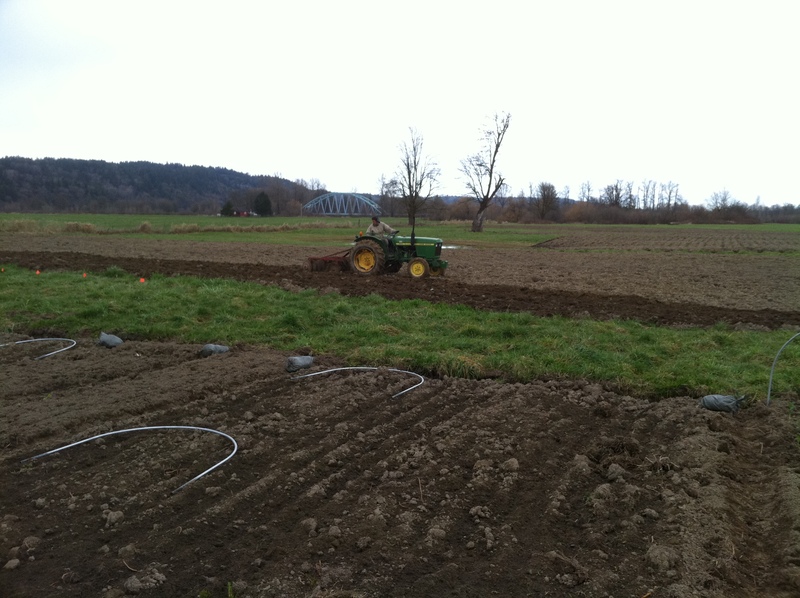 And Brady disked another acre so it’ll be ready for April….. we’ve planted one acre already. And finally, this afternoon, while workers were removing the asbestos ceiling from the farmhouse we are almost ready to move into, we planted twelve beds of potatoes… phew. Great post! I got tired just reading about all your hard work. Looking forward to eating the results. yay! you folks are rocking it! can’t wait to check out the new spot, will be up in late april. Awesome! I think it’s going to be a great year for you guys. I’m looking forward to watching it all come together! Your accomplishments are MAJOR!! If only you had your farm on Vashon!! Best of luck and here’s hoping for great weather!!! Also, Steven at Sound Spirits is looking for a pineapple mint farming source. BTW, Sophia Katt – I thought your kitties preferred the store-bought stuff?